I'm a big fan of the Old Fashioned. I make them at home all the time, we always have them at the bar and like to play around with different variations; so I was thrilled when my friend Ashlie asked me to make her one at her house. So I get out the Bourbon (because there was no rye), put in a couple shakes of bitters, add some simple syrup, twist of orange, etc. And as I'm finishing the drink I look up and she has a look of absolute disgust on her face. I believe her actual response was, "What in the hell is that?" 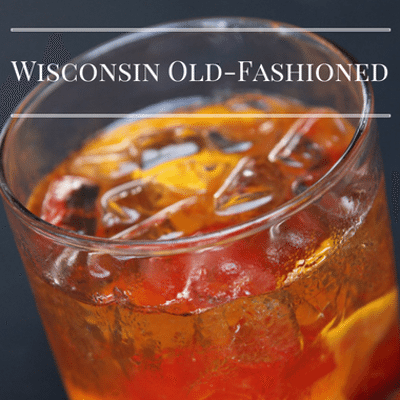 As it turns out, in Wisconsin, the Old Fashioned is it's own thing. About 10 years ago or so when craft cocktails really started to catch on, people got really, really militant with the Old Fashioned, myself included. Wisconsin though has their own thing going and truth be told, it deserves some recognition. The Wisconsin Old Fashioned goes like this: You muddle a sugar cube with a slice of orange and a cherry. Normally we call this "heresy". When you have a nice sugar/fruit sludge going you add a few dashes of aromatic bitters and fill with ice. The base of this drink is either Blended Whiskey or Brandy. Not really nice brandy though, don't whip out some XO Cognac or anything crazy. Truth be told I use Korbel. Finish the drink by topping it with "Sweet OR Sour". My friends from Wisconsin insist this means Sprite or Squirt. Take a moment if you need. This drink goes against tradition, God, and nature. That being said, if someone from Wisconsin tells you that a drink is good, you should listen. It's absolutely delicious, but I'll never admit that to Ashlie. This November we'll be offering a Wisconsin Old Fashioned with Whiskey or Brandy, Sweet or Sour. I don't think you'll regret it. Unless you do, in which case blame Wisconsin.